P. D. Mines*, D. Thirion, B. Uthuppu, Y. Hwang, M. H. Jakobsen, H. R. Andersen, C. T. Yavuz* Chem. Eng. J., 309, 766-771, (2017). DOI: 10.1016/j.cej.2016.10.085. 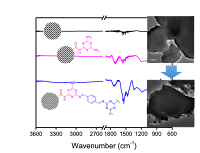 Nanoporous networks of covalent organic polymers (COPs) are successfully grafted on the surfaces of activated carbons, through a series of surface modification techniques, including acyl chloride formation by thionyl chloride. Hybrid composites of activated carbon functionalized with COPs exhibit a core-shell formation of COP material grafted to the outer layers of activated carbon. This general method brings features of both COPs and porous carbons together for target-specific environmental remediation applications, which was corroborated with successful adsorption tests for organic dyes and metals.